Today I would like to introduce you to a new book written by Susan Van Allen, the book is 100 Places in Italy Every Woman Should Go. I am not a book critic, but I do love reading and above all I like when travel writers make sure to give up to date and thorough information on the places they suggest their readers should visit. So when I read the part about Venice I was very impressed (some times travel guides can be so generic and misleading) because Susan Van Allen has given well described and useful information on many activities to do in Venice, which are usually overlooked by other travel books. 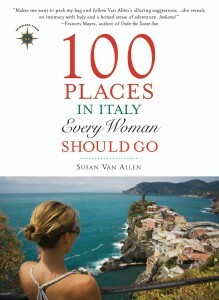 I am very happy to suggest the reading of this book and to prove so I am also going to give everyone a chance to win a copy of Susan Van Allen’s 100 Places in Italy Every Woman Should Go. Just read this interesting excerpt about the Mosaics School of Orsoni and then answer one question at the bottom of the post to enter the competition. I am just waiting now to go and have a nice visit in the Orsoni School! trict, off a fondamenta that wasnt even on my Streetwise Venice map. where Nobel Prizes are awarded, to buddhas in Bangkok. because theyre surrounded by all this pretty sparkly stuff all day. seconds and then was slid away to cool, like iridescent pancakes. thousand hues of smalti to choose from. class here, to have access to all that, Connie told me. much shes gotten commercial commissions for her creations. of wine and cheese, put in a Pavarotti CD, and get to work. About Susan Van Allen : Susan Van Allen’s love for Italy stems from her maternal grandparents, who emigrated from Southern Italy. She was born in Newark, New Jersey, and grew up on the Jersey shore amidst wonderful food and drama. When she first stepped off the train into Roma Termini in 1976, she got hooked on Italian travel. Since then she’s explored the country up and down the boot–visiting relatives, immersing herself in the country’s masterpieces and culture, taking language and cooking classes, and going on boating, biking, and hiking adventures. She’s written about Italian travel for over twenty-five media outlets, including National Public Radio, Town & Country, Student Traveler, Tastes of Italia, Chicago Daily Herald, several Travelers& Tales anthologies (including Best Travel Writing 2009), and CNN.com. She has a following for her monthly Letters From Italy column on the Divine Caroline website. Van Allen also writes for television, and was on staff of the Emmy winning sitcom Everybody Loves Raymond. When she’s not in Italy, she is based in Los Angeles, where she lives with her husband and makes scrumptious lasagnas. Travelers Tales has nicely offered a free Iphone app release copy of “Susan Van Allen’s 100 Places in Italy Every Woman Should Go” for one lucky reader of MonicaCesarato’s blog. If youd like to win a copy, please leave a comment answering this question: What is the first thing that comes to your mind when you think of Venice? Leave your comment by 11:59 p.m.(Italian Time) on Tuesday 11th May 2010 to win a free copy of Iphone app release of Susan Van Allen’s 100 Places in Italy Every Woman Should Go. I will pick a winner randomly and I will be announcing the winner via Twitter @monicacesarato. Traveler’s tales have 3 other great travel books on Italy! Previous PostPolenta: why do we like it so much in Venice? The first thing I think of when I think of Venice is ORSONI (since I make mosaics and would love to go this school) and CANALS and GONDOLAS. The first thing that comes to my mind when I think of Venice is my Venetian boyfriend! But other than that it is the smell of the warm breeze on a summer night as I wander the calle and listen to the water and the faint sounds that remain un-muffled and drift out of the apartments. It is the peaceful liveliness of the traditional neighbourhood that has managed to retain normal life in the midst of a tourism overload. Lastly, it is the sense and observation that everything in Venice is, has and will be done in the same manner – with pride and tradition- at any cost. It is a most unusual city, born out of unusual circumstance and surviving to remind us all that fantasy and real life can co-exist if we let our minds and emotions lead us. Ok…not a woman but I do love Venice. My first thought…with each bit of spray that I feel on my face as my “taxi” approaches Venice from the airport, I feel the happiness within me build because I will dry off that spray when I arrive at my favorite place place on earth. As a mosaicist, the first thing I think of is Orsoni: the Smalti, the classes, the art, and the Domus. Coming to Venice is on my short list of things I MUST DO. I also cherish the idea of being in such a beautiful city, and enjoy daydreams imagining myself there! Orsoni. And Orsoni. And Orsoni. Venice=Energy, enticement, La Doce Vita! A special place on earth! Venice=Energy, enticement, La Dolce Vita! A special place on earth! What is the first thing I think of when I think of Venice? Footsteps, growing louder as they approach, while you’re standing at the end of an alley having made a wrong turn again! My first visit to Venice was during a November many years ago: most tourists were gone, students had just finished exams, and the streets and canals were eerily quiet. It was cold, but I love that Venice. Thanks for running this contest, Monica! See you on Twitter! I think of the first time I stepped foot on Italian ground – stepping out of the Venice train station after a lifetime of anticipation going to Italy – I was nervous that it would not life up to the lofty expectations I had built up in my mind. but as I stepped out of that station into the bustling world of venice before me, boats whizzing by, and felt the general air of excitement and passion around me, I knew at that moment my life was different. And it sure has been! And the winner is…………….Melanie Renzulli! Thanks for taking part and thanks for the lovely comments! Your prize will be sent to you via email! Thanks everyone for leaving your comments and taking part in the competion, I hope to see you all soon again on my blog! Ciao a tutti da una Venezia Assolata!